It's Friday already and I had a busy and excited week. Beside that I made my first official client happy, I'm getting more projects to do interior styling. I'm happy to see myself grow and be my own boss. Next week and the week after that I'll be having some busy times as I'm going to be part of program for kids called "Ban Lesa" which means "Let's read". It's an initiative from our local Public National Library Korsou and I'm happy to be a part of this to help kids learn the importance of reading books. But I'll be going into that more the coming weeks. So lets get in to the Friday Lookouts & Blogloves. 1. This is one of those blogs that I really love. Beside her blog, Soraya has her own business. She does photography, interior design & styling. She also has her own webstore. How cool is that? She's now traveling Egypt to find more beautiful pieces to add to her collection. And she's also from Egypt, so she's at her second home right now. 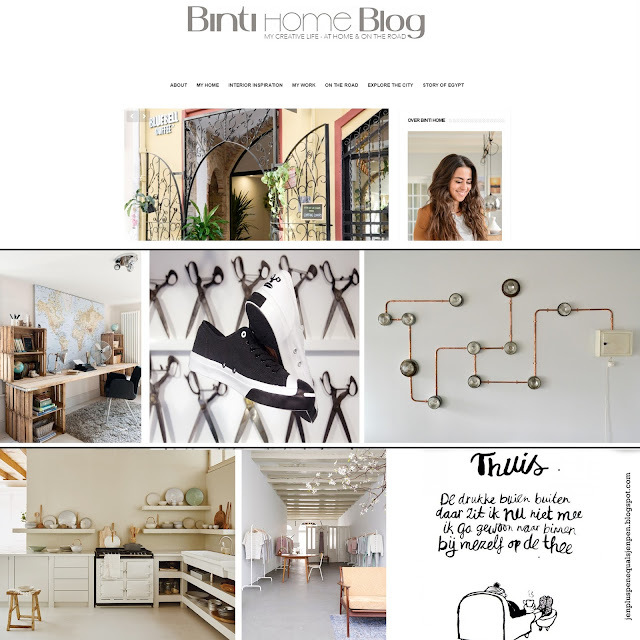 So please go check out her blog, called Binti Home. Soyara, I salute you! 2. Check out the DIY working area I posted last wednesday. 3. Loving these Converse sneakers and how about that backdrop?!! 5. The simplicity of this kitchen has taken my breath away. 6. This is one store beautifully photographed. I love that's it's very simple, but yet very elegant. 7. Quote for the day: "Home: I don't like the rainshowers outside, so I'll go have tea by myself"
Sounds strange in English, but if you read in in dutch (cause it's in dutch) it makes lots of sense. I love the DIY working area. It would be perfect for my office! Being a military family we move a lot, and because of that I am always struggling to "redo" my office. This would be easy to make fit in any room! I love the kitchen, it really is so beautiful simple and elegant all in one. That's what I thought, when I saw it too.